China is widely viewed as a global powerhouse that has achieved a remarkable economic transformation with little political change. Less well known is that China's leaders have also implemented far‐reaching governance reforms designed to promote government transparency and increase public participation in official policymaking. What are the motivations behind these reforms and, more importantly, what impact are they having? This puzzle lies at the heart of Chinese politics and could dictate China's political trajectory for years to come. 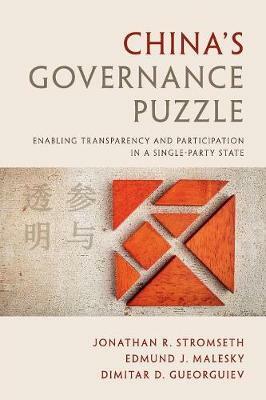 This extensive collaborative study not only documents the origins and scope of these reforms across China, but offers the first systematic assessment by quantitatively and qualitatively analyzing the impact of participation and transparency on important governance outcomes. Comparing across provinces and over time, the authors argue that the reforms are resulting in lower corruption and enhanced legal compliance, but these outcomes also depend on a broader societal ecosystem that includes an active media and robust civil society.